Do you and your family love the smell of bread baking? We do too. Treat your family and friends to one of these delicious, in-season recipes. 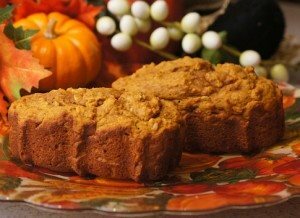 This flavorful combo of pumpkin, walnuts, raisins, pumpkin pie spice and dates complements the rich cream cheese filling inside each slice. We doubt you’ll be able to stop at one slice. Get the recipe here. With grated apples, apple cider and a caramel swirl (spreadable dulce de leche), this bread would surely impress both friends and family. The tart apples balance nicely with the sweet dulce de leche. Eating a slice is almost like taking a bite of a caramel apple—minus the stickiness. Click here for the recipe. Made with creamy peanut butter, brown sugar and buttermilk, this recipe is rich and unique. The topping features salted peanuts, flour and brown sugar. You’ll find the recipe here. With chunks of chocolate and a strong coffee taste, these could be a winner. They’re easy to make and taste especially good when they’re paired with your favorite coffee flavor. Get the recipe here. This savory variety is ideal for an open house or casual brunch. It can be made in many different ways—you can change the type of beer, cheese and other extra ingredients. There are apple-cheddar, manchego-jalapeno and sopressata-asiago versions. You’ll find the recipe here.